I would like to share with you the story of Hidden – a project that was developed by a student in the 11th grade under the umbrella of Adobe Youth Voices and iEARN. This project then grew naturally into a bigger project as the result of a 10th grade student. Let me start first by showing you the video – Hidden – by Robin. Robin then saved various layers, and combinations of layers, as jpegs for inclusion into Adobe Premiere Elements. Adobe Youth Voices is a global philanthropic initiative to empower youth. Svetlana Yakubovskaya from Minsk, Belarus and Juan_Domingo Martinez from Esquel, Argentina led a great online course with 20 or so other educators from around the globe. Then the students and I started our plans for the media projects. It was a challenge for us all to agree on a plan and we changed the plans as we moved through the process. Students finally decided to create their own media arts pieces out of their previous work in Media Arts class. All the results have been posted on the YMCA Academy YouTube channel. Robin believes that art should not be hidden for only people with money to see. He sees graffiti as a form of art that is available to all. I believe his work is so successful for several reasons. This project was his. He owned it. He created the idea. He had the passion. He had the motivation. He wrote the rap. He composed the music. He performed it. He struggled with the contradictions. He overcame the ambiguities. He was in charge and maintained focus and effort until completion. Once posted to the Adobe and iEARN websites, Sasa Sirk from Slovenia contacted me. She is a teacher who is running a graffiti project called Listen to the Walls Talking – an iEARN project. She asked if Robin would be interested in collating some of the works of other graffiti artists from the project. He agreed. However, Alex (10th grade) and Robin joined forces and decided to take some previous knowledge of Google Earth and produce a multimedia Google Earth tour of graffiti sites from the Listen to the Walls Talking project. Again, their idea…their initiative. Their passion. To see their results (a work in progress! 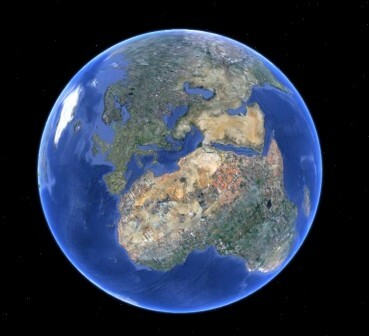 ), download this kmz file, double click it, and Google Earth will open up. Click on the various sites in the sidebar and then click on the placemark to see the artwork from that location. (Here’s how to do that.) In some cases, you will see ‘street view’ of that location as well. (See McDougall Lane in Toronto for an example.) Please be aware that this is a rough draft of an adventure in learning. We, by no stretch, understand the intricacies of Google Earth at this point. I downloaded your kmz file the second I learnt about it. Google Earth opened up zooming in on my part of the world – with 3 lovely green houses marking locations of Ljubljana, Zagreb and Sagrado Walls Talking photos – it’s so cool to connect dots from this perspective – scattered here and there on our lovely planet, which is so full of amazing discoveries and creative people. 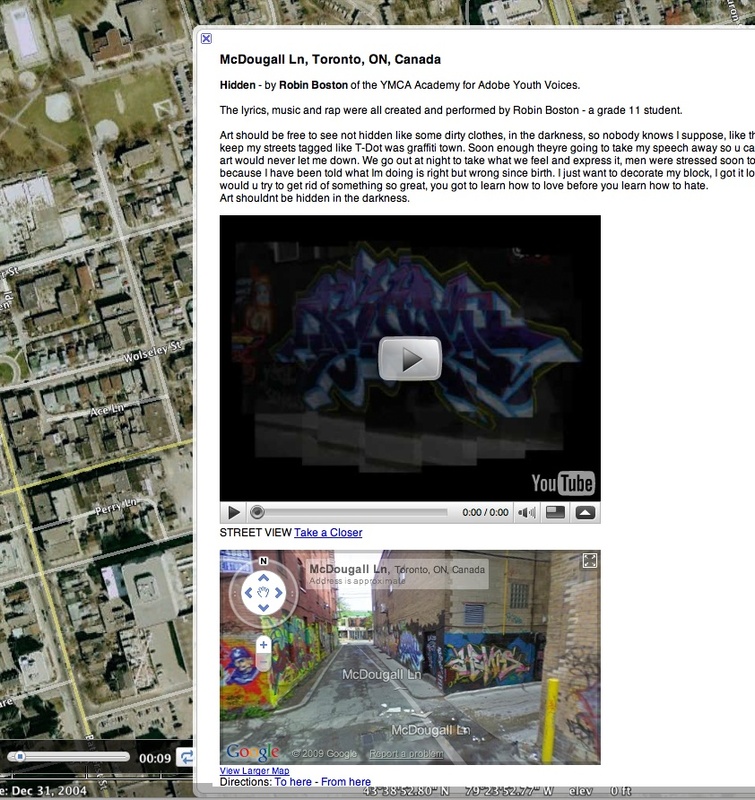 Thank you so much for sharing your Google Earth explorations, for including the graffiti photos from the Walls Talking group, for making our little planet really really small for awhile :-))). Imagine the possibilities if everything was geotagged! I spinned our globe over to your end of the world, enjoyed Robin’s Hidden and felt as if I can reach you guys and grab you by your sleeves and say what a great job! Thanks a lot! The Construction Zone represents some of my thinking about education and about ‘who is in charge of the learning‘. I believe that people construct their own knowledge, often socially, while in the ‘zone’—a state of ‘flow’—at the edge of their competence.